While teaching Dracula, I have started showing the film Dracula Untold. 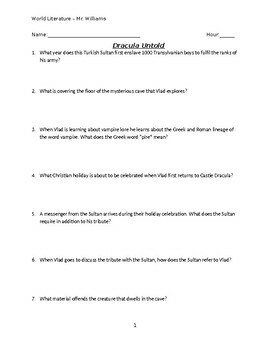 Since the novel never really gives a sufficient explanation as to how Vlad the Impaler becomes the villain in Bram Stoker's novel, I like to have my students come up with an explanation as to how Vlad becomes Dracula and then we watch the film to see Hollywood's explanation. This document is 13 questions that go along with the film and to help make sure that they are engaged. The questions do in fact go in order and the second two pages of this product are the answers. I have found that my students do enjoy watching this in class.